Even though this was the last big superhero movie of 2014 that I had been looking forward to, the biggest reason why I wanted to see this movie in theaters is because of my daughter Jena and her 8th birthday this Saturday, November 8th. So that was the mindset I was in when I made it to the theaters to watch this latest Disney animated movie. In fact, I realized that even though I’ve had a pretty poor theatrical track record for the past several years, I had seen every Disney Animated movie in theaters since Wreck-it Ralph a couple years ago. There has become a finer line between the Disney animation studios, as the quality and subject matter between Disney Pixar, Walt Disney Animation Studios, and to a lesser extent the DisneyToon Studios with the likes of Wreck-it Ralph and Frozen being as good or better than Monsters University or Brave. So I was hopeful that the trend would continue with the first animated collaboration between Marvel and Disney. I have seen most of Marvel’s previous animated works and they were nothing special, and even though this movie doesn’t have any connection with the live action Marvel Cinematic Universe, I was still very excited to see it based on the trailers. I was hoping for a lot of laughs, a lot of action, and I had already heard that it had a lot of heart, and that’s exactly what I got from it. It’s true that it was fairly predictable even when it was trying to throw some twists out there, but it was still done well enough that I didn’t much care and just enjoyed the ride. Not only that, but Jena was there and completely on board for the whole ride as well. And as always here, I will be discussing the movie as a whole including any plot twists and reveals, so spoilers have been warned. 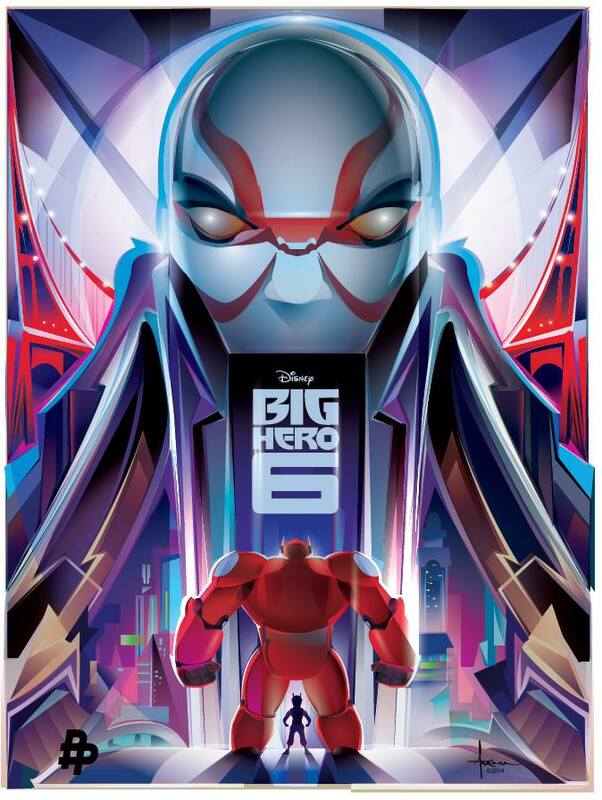 Even though the movie is named after the pseudo superhero team called Big Hero 6, a name that is never actually spoken during the course of the movie, the main protagonist is a young boy named Hiro. He’s a 14 year old robotics genius who has already graduated high school and spends most of his spare time finding illegal bot fights and hustling them with his puny looking, but fearsome little fighting robot. Long story short, we get a nice sequence where his brother becomes his inspiration to further his education rather than taking the easy way out making money through bot fights. But as many superhero origin stories go, his brother Tadashi soon dies a heroic death leaving Hiro in a deep depresssion until he rediscovers his brother’s robot Baymax. The entire rest of the movie essentially becomes about how Hiro is able to deal with his brother’s death going through the different stages of grief with the help of the health care professional robot. I don’t believe it specifically follows the traditional seven stages of grief, but it starts out where Hiro is withdrawn and lethargic until he discovers a supervillain who was likely responsible for his brother’s death. He then moves onto revenge before finally coming around to acceptance at the end of the movie when Baymax helps him remember Tadashi. Baymax is the character featured in most of the teasers and trailers and for good reason. He is able to represent so many different things. He is very childlike with his naivety, his gentle and curious way of moving through spaces, and his general clumsiness. But he also has a great deal of wisdom with his high tech sensors and encyclopedic medical knowledge database where he is able to see the problems that most people would overlook because they either don’t want to see it, or because they just don’t really know how to deal with it. And he is also the conscience of the movie, as his programming requires him to do everything within his abilities to help not only physical ailments, but also mental distress such as Hiro’s grief over the loss of his brother. And yet, Hiro is an intelligent young kid who is able to use that good natured programming and use it for his own needs when he finds out that there was someone responsible for his own loss, especially when that person is a supervillain. It would be true to say that this movie does cover a lot of already tread ground. There are several instances of what could be considered twists that I saw coming from nearly the very beginning. During the science fair, there is a rivalry set up between the good natured professor Callaghan who is a Tadashi’s professor and the industrialist Krei who cuts corners to turn a profit. It felt like the movie was pushing so hard for the audience to expect that Krei would be the Kabuki mask villain that it wasn’t as big of a surprise when it’s revealed that it was actually Callaghan. It’s also revealed that the motivation for Callaghan’s plot is because his daughter used to work for Krei and died when they were testing a new teleportation device and she got caught between the portals. Where teleportation is concerned, there is always the chance that what was lost can once again be found. And while it was still extremely touching, Baymax’s sacrifice at the climax of the movie was all to reminiscent of Iron Man’s almost-sacrifice at the end of the Avengers, complete with the last minute saving of the chip so he could be rebuilt. There’s an interesting connection between Hiro and Callaghan. They are essentially both seeking revenge for a loved one who was killed through the mistake of someone else. Callaghan felt that Krei was responsible for his daughter’s accident, and Hiro felt that Callghan was responsible for Tadashi’s accident even though it’s never revealed if Callaghan actually started the fire himself or if he just used the fire to his own advantage. Callaghan uses Hiro’s microbot’s for his own villainous purposes rather than the beneficial ways that Hiro had intended just like Hiro uses Baymax to go after Callaghan in superhero armor rather than the personal health care assistant that Tadashi had intended. There’s even a point where Hiro removes Tadashi’s program chip, leaving only Hiro’s combat chip which turns Baymax into a Terminator-esque fighting machine with no regard for anyone’s safety. Which leads to a great moment where Baymax’s programming kicks in and no longer allows Hiro to have the chance to remove his health care chip again. Something that can’t be overlooked is how progressive this movie is when it comes to looking at a superhero team in general. While there isn’t a female lead, two of the six characters are female. Two are also Asian, three if you count Hiro’s brother, one is black, and four are nerds. There’s even some more subtle twists on the stereotypical character types. The goofy comic book nerd mascot Fred actually comes from a wealthy background and lives in a mansion. The big burly looking black guy is actually a bit of a wimp who And of course, there is some overlap between those categories. I also appreciated the fact that every time Honey Lemon said Hiro’s name, it sounded like the correct Asian pronunciation without feeling forced. But what this movie really does is that it is able to be a fun filled ride from beginning to end. It has the right mix of jokes, action, and heart to keep most people satisfied. I loved the movie, my daughter Jena loved the movie, my wife loved the movie. It may not be a perfect movie, but it was a hell of a ride. Until next time, this has been Bubbawheat for Flights, Tights, and Movie Nights. Posted on November 12, 2014, in 10's movies and tagged animation, disney, film, Marvel, movies, review. Bookmark the permalink. 14 Comments. This was such a great movie, and like I say in my review, I think Disney made a smart move by adapting a little known Marvel comic for their grand animated venture…because there is really no one out there who is going to be pissed off. I found this really fun, moving and memorable. Nice review! Yeah, I heard how many changes they made from the comic and it seemed like they were all for the better. I believe there were only like 17 issues, that’s pretty obscure. Enjoyed the review. Glad your daugher liked it! Yeah, although she has since more or less forgotten about it already. It has been almost a week now! I’m sure it will pop up again once it hits home video. I enjoyed this immensely! Right now it’s actually ties w/ Lego Movie as my two fave animated features of the year! Baymax is simply adorable and I love the brotherly relationship that’s fully realized and convincing. I find myself more emotionally connected w/ the characters here than in Interstellar, it’s genuinely moving but also a lot of fun. I definitely will get the Bluray! Yes, it’s a tough choice between this and Lego movie, though I might lean a bit towards Lego myself. The home video release Assault on Arkham (aka Suicide Squad) was a lot of fun too. I had read a mini review on The Nerds of Color site who didn’t care for the black guy’s cowardly persona, but overall I liked how all-inclusive it was. Not only that, but while most of the characters were one-note, they weren’t one-note based on stereotypes. Gotta see this. I think I am more enthused than my kids are. Watching good films like this with your children are always special. Good review, like always, Bubbawheat! Yeah, we’ve had a nice run of theatrical visits the past couple years with Wreck-It Ralph, Frozen, Lego Movie, and this one. And she’s gotten a few more without me as she saw Book of Life a couple weeks ago with her Aunt and cousin which I really want to see too. A cute, entertaining tale of a hapless robot who must mend the broken heart of a young boy whose life takes a depressing turn.